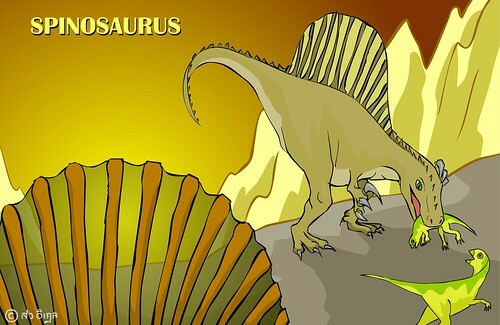 Currently, Spinosaurus is considered as the biggest carnivore dinosaur. It got a big jaw with sharp teeth and big arms with sharp claws. The scientists always have arguement about the sail on Spinosaurus’ back. The possible assumptions are the sail might be for controlling its body’s temperature, and the sail might be used to court the female. With this huge body, everyone is interested to calculate how many tons it might eat per day. Roll mouse over the big dinosaur, you will see the information. Roll mouse over the sail, you will see its sail getting the sun light.